This intuitive, accessible program allows you to quickly and easily create accurate floorplans, elevations and cross-sections that can be viewed and exported in 2D and fully interactive 3D. Whether you’re planning to go it alone or simply want to be able to better communicate your project vision to your architect or builder, this powerful software will help you streamline the design process and save money along the way to realising your dream home. Create and share 2D house plans and detailed, interactive 3D impressions of your new home design with Build It’s powerful, easy-to-use software. 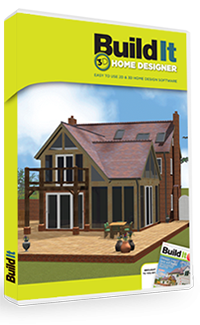 Build It 3D Home Designer is available to buy as an online download for just £150.